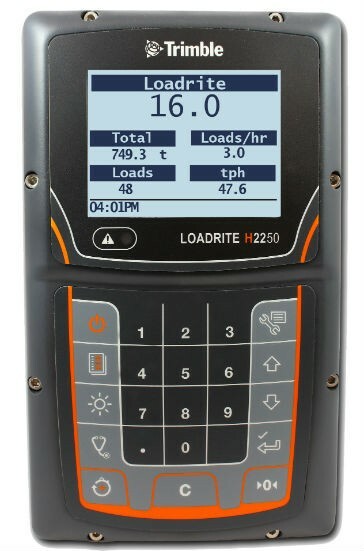 Trimble LOADRITE H2250 Haul Truck Monitor. The H2250 provides a near real-time reporting of haul truck production and process monitoring, driving increased production and limiting costs. It helps quarry managers, supervisors and operators by presenting information to monitor and improve the processes and handling of the quarry haul fleet. H2250 is suitable for rigid body haul trucks in the aggregates extraction industry, in both pit truck and bin truck applications. The H2250 provides automatic haul truck load counting, and payload measurement to within +/- 3 percent accuracy (typical), It also features near real time production reporting, truck speed monitoring, cycle time analysis and location based material tracking. Using data from the H2250, fleet managers are able to empower operators and make informed decisions of haul truck process improvements. Benefits include lowering transport costs by optimizing payload, reducing cycle times and supporting safe operation of haul trucks. H2250 productivity reports show accurate production figures removing the need for tally sheets and production estimates. Highlights material movement issues e. g. poor haul road construction and inefficient product movements. Cycles time reports include graphical reports of haul truck activity, loading time, haul time, queuing time that show machinery availability and allow fleet managers to make improvements that affect production during the shift. Speeding reports overlay speeding events over quarry maps to identify operator skill gaps or haul road design issues to improve machine operation, fuel consumption and reduce machine wear. For a quick understanding of haul fleet productivity, the dashboard shows each truck’s cycle count and daily tonnage to help managers check their haul fleet is meeting plant demand, adjusting to changes in cycle time, product ratios, etc. On-screen alerts provide speeding, rollover, tray-up and overloading alerts. The H2250 is suitable for rigid body haul trucks in the aggregates extraction industry.